Who Rules: The Serpent Council, nine noble men of the city. Who Really Rules: The Elder, an ancient undead Mummy, who dictates rulings to the Council. Other Power Centers: Lord Ga-Gronk, an oluk orc diplomat from the Nameless City, who exerts much sway on the Serpent Council and even the Elder. The will of the Wintervale will not be denied even here. The necromancers of the Circle of Eternal Thrall, who create the undead slaves so prized by the rich of the city. Khesef, high priest of Vornok-ka, who heads the clergy of the city. Population: About 6,000 in the city itself. The population is three quarters human, with the rest consisting of orcs, half-orcs, and undead. Major Products: Budum-Ishi exports slaves and grain from the fertile fields that line the River Ishi. Armed Forces: A small force of shock troops, orcs, humans, and undead, mans the palace of the Serpent Council and patrols the city itself. The city is rarely attacked by an external enemy, however, for fear of the walking dead who patrol its streets as slaves and who are fierce fighters when ordered to defend the city by the Circle of Eternal Thrall. The Wintervale also protects the city. Budum-Ishi, a crumbling desert city built with giant blocks of sandstone, is a decadent community that is slowly decaying. The city sits on the bank of the River Ishi. 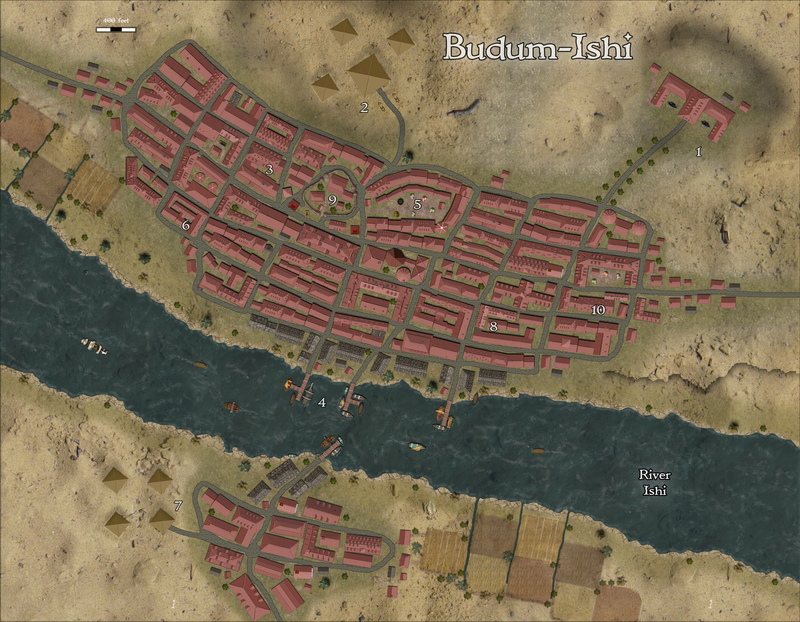 The fertile river-valley, though bordered by deserts, is agriculturally rich, and Budum-Ishi ships from its constantly busy ports much of the grain that feeds both the Far City and the enemy lands to the North. The town and its environs are peopled with men of light brown skin. This city is ancient indeed, and it once held sway over a civilization that encompassed the entire area in which it is set. Now this venerable place and its smaller sister city of Sefu-Ishi are all that are left. The people of the city practice ancestor worship and construct great tombs and monuments to the ghosts of the past. The Budum-Ishians sacrifice many slaves by walling them up alive within their ancestral crypts. They worship gods with the heads of animals, the Lord of whom is Vornok-ka, or Vornoth, pictured as a man with the head of a bat. The patron god of the town is Seket-ka, the snake-headed being in whose name the Serpent Council rules the city. As a people, they are concerned with dark and ancient secrets and magics of all sorts. In fact, necromancy thrives in the city, as the very rich see it as an honor to use the dead as their slaves and guards. Thus the streets are literally swarming at certain times of the day with hordes of undead in various states of decay, going about the business of their masters. Noble families also see it as an honor to raise a departed loved one to the state of holy undeath. These "ancestral spirits," given no orders, drift from room to room inside the mansions of their rich relatives as if searching for something. Necromancy and magic in general are closely regulated within the city, however, and only the clergy or the Mages of the Circle of Eternal Thrall may legally bring a creature back from the dead. The city is dominated to the north and south by large ziggurats; in the Northern pyramid dwells the Elder, an ancient King of Budum-Ishi who through the dark arts still asserts his evil influence on the Serpent Council. Twice a year condemned criminals, slaves, or maidens are sacrificed on top of the Elder's pyramid; their blood drips through a special slot in the peak to strengthen the hideous thing below. The clerics of Vornok-ka and Seket-ka oversee this ritual and chose who is sacrificed. Because of the city's fascination with magic and the dark arts, it has spawned many powerful mages over the centuries. Khadufel the Southerner, former mage of the mercenary group The Eye, originally comes from this city, and each year the agents of the Wintervale recruit many battlemages to swell the ranks of the Dark Armies.